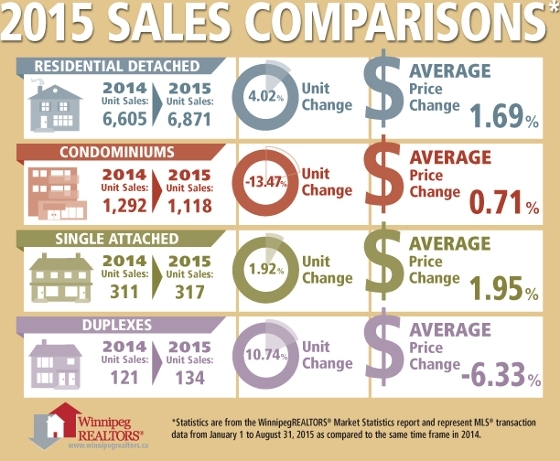 WINNIPEG - The strong sales performance in August resulted in bringing year-to-date sales ahead of last year for the first 8 months of 2015. Last month 2014 was ahead slightly but the lead slipped away by the end of August owing to the 11% increase in sales over August 2014. Dollar volume on the other hand has remained ahead of 2014 throughout the year. In fact, August reinforced this consistent edge by setting a new dollar volume record for this month. Over $340 million was transacted through the MLS® in August with one single family home sale fetching $2.1 million. Year-to-date dollar volume is now over $2.5 billion. It is up nearly 3% over last year and is the highest level it has ever been for the first 8 months. At 1,258 sales, August 2015 is right up there with the best. The three higher August month sales on record are modestly better with none reaching the 1,300 level. As for listings, compared to the last few years, where there was a 25% and 19% increase in MLS® inventory by month end over the previous year, this year’s 5,600 listings is more restrained. It is up less than 10% from August 2014 and down nearly 400 listings from last month. Nevertheless, the healthy supply of listings which roughly equates to four and one-half months on hand if no new listings were to come on the market, has not gone unnoticed by buyers wishing to take advantage of historically favourable mortgage rates and some of the more affordable house prices in the country. Manitoba boasts one of the lowest unemployment rates in the country and has shown positive gains in job creation. Its unemployment rate has averaged 2.1 % below Canada’s rate over the past 15 years. Manitoba’s GDP is expected to be the third best in the country at 2.2% in 2015. While condominium sales have been the subject of some concern this year some perspective is in order. Based on a five-year average of sales up until the end of August 2015 sales of 1,118 are only down 3%. The 160 condo sales or 26% increase in August over the same month last year has narrowed the year-to-date deficit from 19% at the end of July to 13% at August month end. Speaking more to the affordability of Winnipeg’s housing market where prices have been held in check due to a very balanced housing supply, the recent release of RBC’s housing affordability index for the 2015 second quarter is helpful in understanding where we fit in a national context. It shows when it comes to buying a detached bungalow based on the pre-tax income needed to service the costs of owning a home at current market values Winnipeg is right in line with Montreal and Ottawa, not far off Calgary and Edmonton and well below Toronto and Vancouver. The most active price range in August for residential-detached sales was $250,000-$299,999 (22% of sales), followed by the $200,000-$249,999 (17%) and $300,000-$349,999 (16%). Average days on market for residential-detached sales was 38 days, a week slower than August 2014. The highest-priced residential-detached sale was a home in Headingley which sold for $2.1 million. The least expensive sale was $35,000. The busiest condo price range in August was $150,000-$199,999 (31% of sales), followed by $200,000-$249,999 (22%) and $250,000-$299,999 (19%). Average days on the market for condominium sales was 55 days, two weeks slower than August 2014. The highest priced condo sold for $501,000 and the lowest priced sale was $60,000.